How much winter would a woodchuck predict if a woodchuck could predict winter? The woodchucks (a.k.a. groundhogs) emerged from their burrows this morning. Some saw their shadows (including the famous Punxsutawney Phil) and many didn't (among the ranks our own state prognosticators, Jimmy the Groundhog of Sun Prairie and Wynter the Groundhog of Milwaukee). Those silly groundhogs never seem to agree when it comes to forecasting the weather! The majority of the Groundhog Day groundhogs are male. Why is that? At least here in Wisconsin we're trying to level the playing field. Wynter the Groundhog from Milwaukee is female. 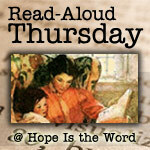 This morning we read a book titled Brownie Groundhog and the February Fox. 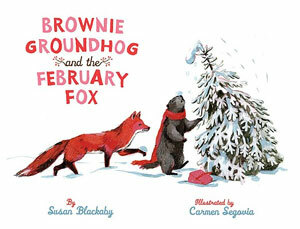 It's about a girl groundhog named Brownie who sees her shadow and complains about having to wait for spring. "Shadows mean more winter, and more winter means waiting. Wait, wait, wait." Brownie stomped her foot. "Phooey!" Brownie is so busy being impatient she doesn't see a red fox lingering nearby. The fox pounces on Brownie and plans to eat her for breakfast. What to do? You guessed it -- implement the old, ever reliable "outfox the fox" tricks. After some quick thinking, Brownie convinces the fox that he has missed breakfast time and now must wait for lunch. Brownie cleverly keeps the fox plenty occupied all day long with skating and looking for signs of spring. When suppertime arrives, both animals witness the first sign of spring and the fox hungrily devours a snack (a tasty wintertime treat, at that)! 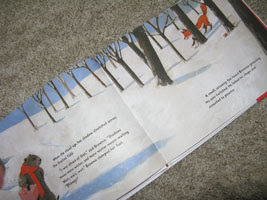 Carmen Segovia's painted illustrations are really quite lovely with the striking contrasts of the red fox and red-scarf-wearing groundhog against the snowy winter landscapes. The story of how this book came to be is quite unusual. Carmen Segovia displayed a series of illustrations at the Bologna Children's Book Fair depicting a groundhog waiting for spring. The illustrations were discovered by Sterling Publishing and Segovia's editor sought out an author to write a story for the little groundhog. Susan Blackaby created this adorable tale of patience and friendship with the little groundhog sketches in mind. 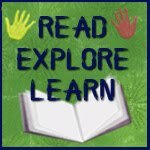 It's the perfect picture book for reading on Groundhog Day or really any cold, winter day that leaves you impatient, longing for some spring cheer! In the story, Brownie and Fox sit down for a picnic of cocoa and cinnamon toast. 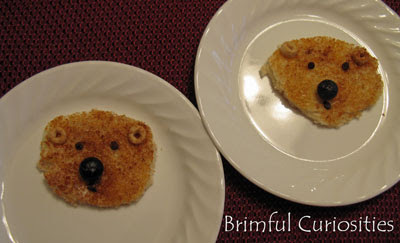 This morning for breakfast we had our own cinnamon toast treat shaped like a groundhog! We did not, however, pounce on our meal. No red foxes in our house. 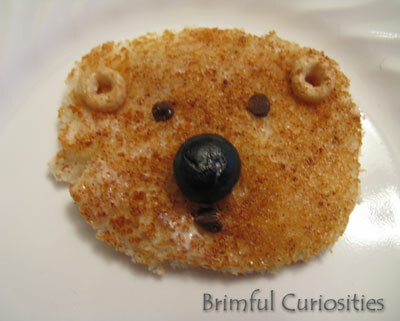 The kids used Cheerios for the ears, mini chocolate chips for the eyes and mouth and a big, fat blueberry for the groundhog's nose. It sounds like an adorable book. Love your breakfast. the book and the groundhog toast look adorable!! I like your groundhog snack, sounds like a wonderful book. That snack looks very cute. I like the cheerio ears. One seriously adorable snack!! And cute looking book! Cute extension of this book. I remember bringing it from the library, but daughter read it on her own. It's interesting to hear the background on how it was made. I love your groundhog snacks, super cute! I love this book! Your snack is so cute! What a wonderful idea!